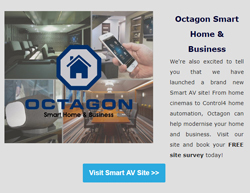 We're exited to tell you that we have launched a brand new Smart AV site as well as some other existing news. Click here to find our more. Imagine having complete control over not only your security system, but your whole home, in the palm of your hand. The ability to control your alarm, your heating, your lights, and even some home appliances, all with your smartphone. 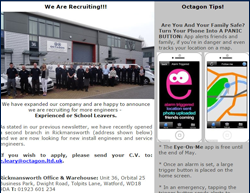 Octagon are very keen to encourage employment of young people. 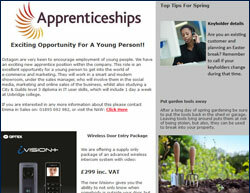 We have an exciting new apprentice position within the company. This role is an excellent opportunity for a young person to get into the world of e-commerce and marketing. At Octagon, we are offering our existing customers the opportunity to receive a £25 Join Lewis/Waitrose voucher when they recommend a friend within October 2015. 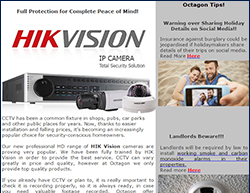 Our newsletter covers the new HIK Vision IP Cameras we are now providing, as well as a range of security tips that will help keep you safe and sound. We will also be supporting the new B2B event 'Hillindon Business Expo' on 9 July 2015 at Brunel University in London. 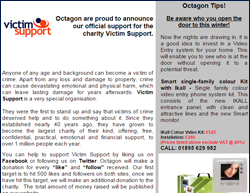 At Octagon we proudly support charity Victim Support. The organisation was set up to offer confidential, practical, emotional and financial support. That support now helps over a million people each year. We believe it is essential to support this cause as victims of crime can suffer both devastating emotional and physical harm. 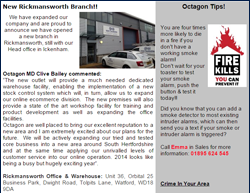 Following the opening of our Rickmansworth Office and Warehouse we recruited new employees to take on the growing demand. The newsletter also covers an amazing new smart phone app that can alert friends and family if you are in danger, and then gives them your position so they can track your location on a map. 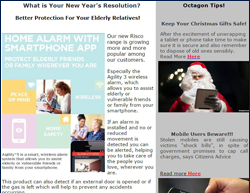 Octagon Security provide Risco's range of security products, including the Agility 3 which allows you to assist elderly or vulnerable friends or family with ease using your smart phone. With an alarm when little to no movement is detected you can be alerted so you can care for your loved one where ever you may be. 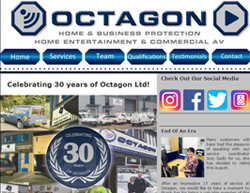 In addition to our head office in Ickenham, Octagon moved into a new branch in Rickmansworth. Our new office and warehouse now allows us to serve an even larger area with quality security and entertainment solutions. 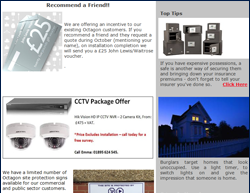 Our newsletter also contains some top tips on how to increase your home or business' security. 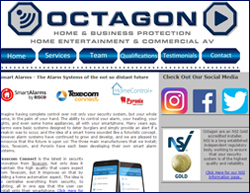 At Octagon we assist countless homeowners with home security. Our team completed an alarm maintenance for Mrs Edwards who is an amazing 105 years old. 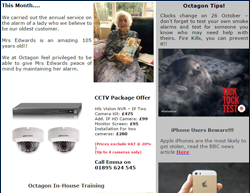 Our team feel privileged to be able to give peace of mind to Mrs Edwards in regards to her security.